We preview the newest Far Cry to find out what's wrong with Hope County. From Africa, through Indonesia and the Himalayas, Ubisoft’s Far Cry series has made great strides geographically and thematically since 2008. 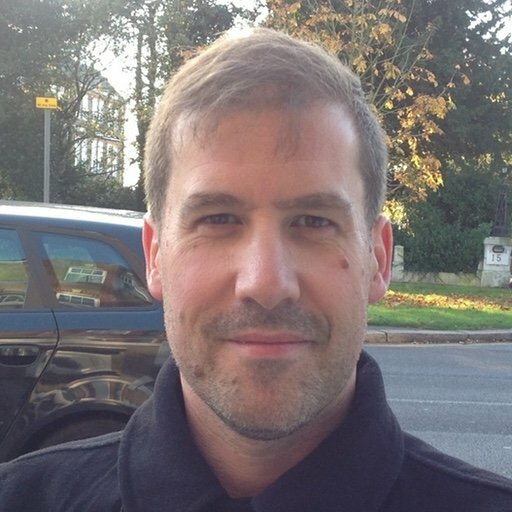 Its revolutionary map editor debuted almost a decade ago in Far Cry 2, which also set standards for open-world quest structure. For this newest adventure, Ubisoft has dialled back on the exotic allure of previous entries, though its antagonists are arguably the wackiest of the bunch so far. Religious extremism in America’s North-West is the hard-hitting theme, carried by typically outlandish caricatures. The publisher is now tackling present-day politics, with the state of Montana as backdrop. While we still have the grand, sweeping vistas, and freedom to explore, we are attracted more than ever to the details up-close, entranced by the disturbing practices of evil-doers, and the charisma of their valiant resistance counterparts. 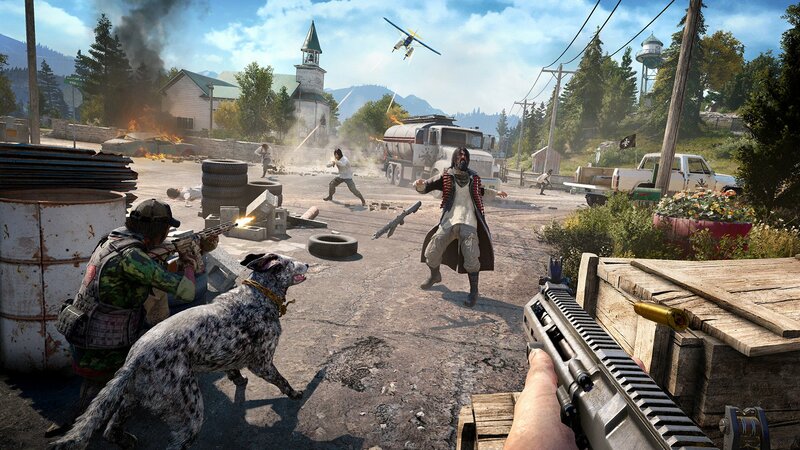 In every perceivable way, the three years or more in development shines through Far Cry 5, in a big-value package that we recently got to explore from the very top. Our hands-on time included both solo and co-op story missions, team multiplayer, and puzzle-oriented Arcade. During our solo session, we were most keenly keeping an eye on how the supposed intuitive mission-structure took shape. 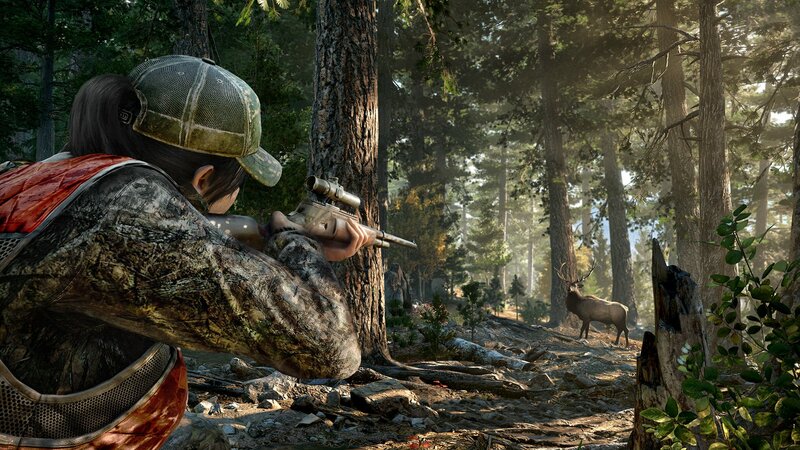 Ubisoft has mentioned several times now that new objectives are discovered via conversation with key non-player characters and items, such as notes, scattered around locations. Instead of climbing radio towers for a grand, task-loaded map reveal, it is hoped that following branching quest lines will prove far less overwhelming. Without a doubt, we felt connected to our role as Deputy Sheriff out of his (or her) depth, on the trail of Christian cultist leader Joseph Seed and his three over-zealous siblings. The playable prologue, which segues neatly into a brief, unobtrusive tutorial, adheres to a very strong narrative thread, from which you have no real need, nor intention, to stray too far. The Seeds, in charge of what is collectively called The Project at Eden’s Gate, are a haunting bunch, who wouldn’t look too far out of place in Dead Rising or possibly even Dishonored, owing to their irregular wardrobe. However, they also seem eerily authentic as psychotic adversaries with a tendency to be cruel, marshalling an army of malevolent followers. Without spoiling too much, we will say that a horrific initial encounter, plainly set up to go wrong in the worst ways possible, is something that you instinctively wish to fly from. 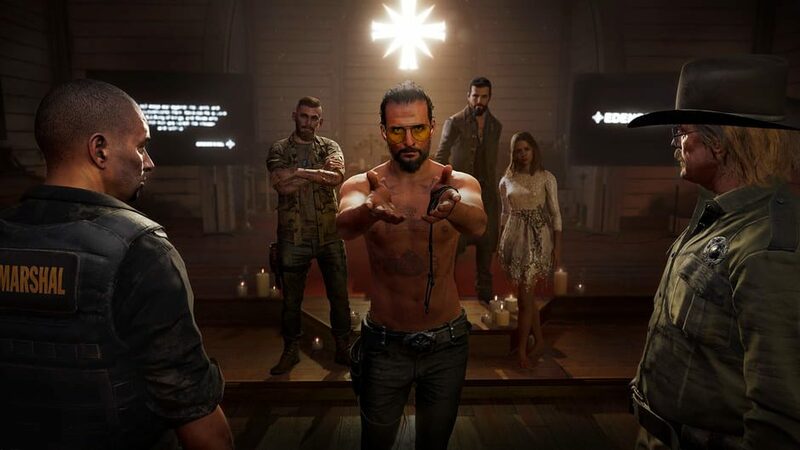 This brings our deputy into contact with an old survivalist named Dutch who lays down the law according to Far Cry 5; keys to the Seeds’ downfall: rescue civilians, destroy cult properties, complete missions, and liberate cult outposts. Familiar Far Cry territory, upon first glance. Before attempting any of the above activities, we were also informed that every action contributes in some way to a Resistance Meter, representing popularity among the good guys, and the degree of notoriety among the Eden’s Gate elite. Ultimately, the aim is to raise the Resistance Meter so high that Joseph Seed will come out of hiding for the final showdown, but we’re getting way ahead of ourselves here. The next most helpful advice we received was to go in search of potential Friends for Hire (NPC mission accomplices), Fangs for Hire (animal specialists), and Guns for Hire (NPC weapons specialists). We’ve had some experience of the latter in Far Cry previously, but the first two groupings are all-new. In the case of Friends for Hire, we first ran into Hurk in a mission called The Prodigal Son. His hapless boy, Hurk Junior, is tasked with retrieving his truck from an Eden’s Gate stronghold. The whole escapade, lasting 30 minutes or more, has Jr., chewing off your ear with awkward humour while literally showing our deputy the ropes (zip-lines), as a means to save time. It ended in a loosely organised assault on a guard post, before stealing back the truck with its mounted machine gun, with which to bring down a cultist chopper in spectacular fashion. Later we fell in with Jess Black ‘The Master Huntress’ who led us on a stealth mission to terminate one of Jacob Steed’s generals, nicknamed The Cook for truly distressing reasons. Jess recounted a long and terrible story of how Cook earned his reputation, which greatly encouraged us to show no mercy, and little concern for concealment, when the time came to take this monster out. This encounter was very different to the Hurk shenanigans, but both entertained with terrific voice-acting accompanying just-about-believable animation. Our attempts to coordinate with a fellow journalist to complete co-op missions resulted in chaos, as expected. That said, we did observe some cool emergent behaviour during one scenario involving the liberation of an outpost. After initially attempting a slow and steady stealth approach, we decided instead to attract attention at a main gate, where we had spied explosive barrels. Sure enough, reinforcements arrived, and were duly blown sky high. While not the most surprising nor original of set-ups, fun communication, and seeing there were numerous routes toward the most satisfying outcome, certainly left us impressed. 12-man multiplayer in Arcade was a surprise, however. Weapon handling and behaviour in Far Cry 5 feels somehow weightier and more impactful than Far Cry 4 especially. Married with the largely unhindered map traversal options, this makes for gripping Call of Duty-style shoot outs. The map editor in this case had been used to create a bombed-out village on a small island, that provided some deadly line-of-sight for snipers, and tightly packed corridors and building interiors for those armed with SMGs and shotguns. After our allotted time was up, we absolutely wanted to play on. Thankfully the other Arcade modes were also superb. Splinter Cell meets… Stranger Things? Among the assets available to players for map editing, Ubisoft includes components from Assassin’s Creed and Watch Dogs to enrich environments with statues and cyber-punk junk. The long-term popularity of these homemade builds will depend on the enthusiasm of the community, of course, but Ubisoft is also chipping in with original examples of its own. We played through a cool stealth mission named ‘Terminal’, resembling the finest from Sam Fisher’s Splinter Cell days, taking place at a dockyard storage facility. This could be played with only a knife or an assault-type load-out, presenting two very different challenges. In addition to this map, Ubisoft had built an abstract art-like escape mission, ‘Journey’, taking place within a topsy-turvy wooden mansion, in which the ceilings became the floors, that became the walls, and so on. The Arcade games were so successful in their distraction, that we hardly missed the core Campaign offering while they lasted. 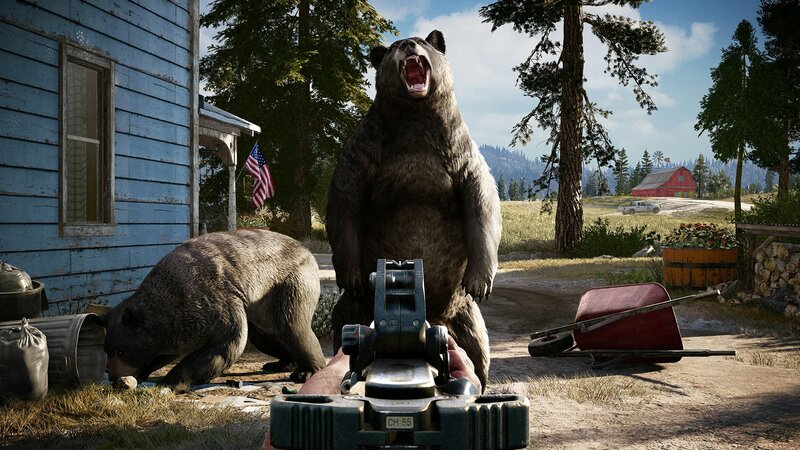 Ubisoft has concocted what appears to be a tremendously high-value package in Far Cry 5, palate cleansers included, so that we may never need to leave Montana for as long as this thing keeps being updated. It is looking like the successor that Far Cry 2 through 4 deserve, and we’ll be excited to play it at length come release on March 27 (on PC, PS4 or Xbox One).